Harley Davidson uses Formotion Products — Formotion Products Inc. Since 2003, Formotion has developed, designed and produced it's patented time and temperature gauges for The Motor Company. We are so proud of our long standing partnership together and the more than 150,000 units in service today. The gauges and accessories you see here are fully track tested to last as long as Harley's bikes do- and that's good to know. 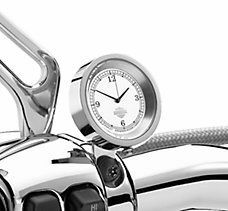 When your grandson is rebuilding that old EVO, he'll be looking for one of these to make sure it has just the right touch - just like the hundreds of thousands have been doing, and continue to do everyday, since Harley Davidson first introduced these classic gauges. These gauges and accessories are available directly from the Harley Davidson Motor company directly. Visit them on the web to order or visit your local Harley Dealer.